Prince George's much anticipated christening date was officially announced by the Palace today. Little George will be three months old when he is baptised on October 23rd at the Chapel Royal in St. James's Palace by the Archbishop of Canterbury, the Most Reverend Justin Welby. The last royal christening at the Chapel Royal was of Princess Beatrice, daughter of the Duke of York in 1988. Aides revealed the couple selected the venue because it's small and intimate; it was a very personal decision for the Cambridges. The Chapel Royal is located in the main block of St. James's Palace. It was built circa 1540 and altered since, most notably by Sir Robert Smirke in 1837. The ceiling is richly decorated with royal initials and coats, of arms, decorated by Holbein. Each year the feast of the epiphany is celebrated on 6 January with a service of holy communion, when an offering of gold, frankincense and myrrh is made on behalf of the Queen. Princess Diana's body lay in private at the chapel for several days before her funeral, offering an opportunity for family and friends to pay their respects. Looking inside the chapel, it's easy to see why William and Kate chose it for a private family christening. As expected, it will be a private event but official photos and footage will be released. It's will very much be a family gathering with the Queen, the Duke of Edinburgh, Prince Charles, Camilla, Harry and the Middletons at the ceremony. After the service, the group will pose together for photographs. 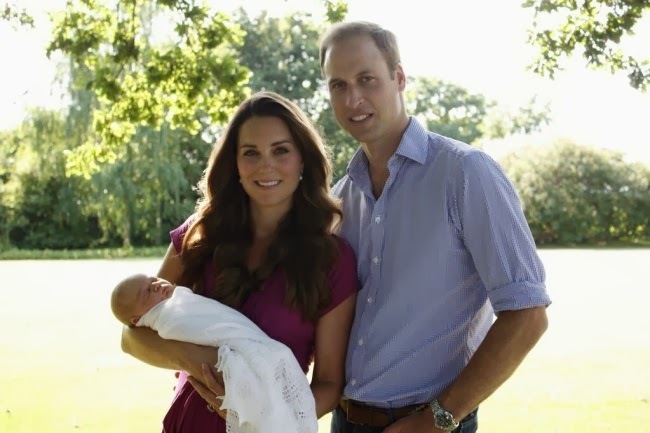 The christening photos will see the release of a photo with the monarch and three heirs. Aside from the date, the main question surrounding the christening has been the choice of godparents. Who will William and Kate choose? Traditionally royal babies have several godparents; Prince Charles and Princess Diana chose six for William and the same for Harry. However we shall have to wait a little longer for the announcement, as the Palace is remaining tight lipped on that front, although I expect we will hear shortly before the christening. The christening will take place at 11 a.m. and end at 12.30 p.m. It will be a very special occasion for the Royal Family and particularly memorable for proud parents William and Kate. 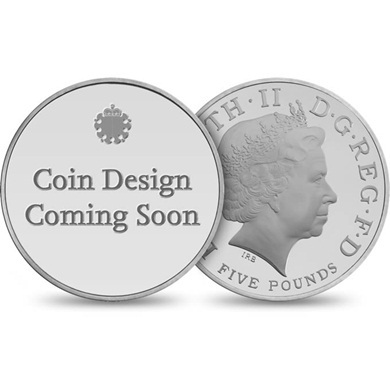 To celebrate the christening announcement, The Royal Mint has some exciting news of its own - the announcement of the first ever UK coins to celebrate a royal christening, with special new designs that have been approved by the Duke and Duchess of Cambridge and the Queen. 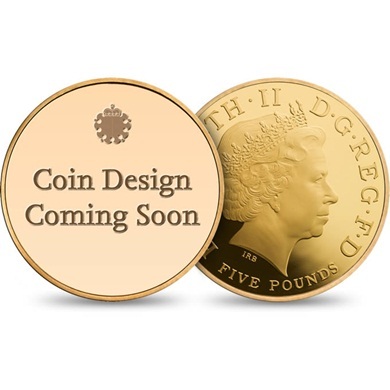 The designs range in price from £13 to £8200 for a five ounce gold coin. The coins are a great memento for royal fans to add to their collection, and they are particularly special as they've got the seal of approval from the royals themselves. 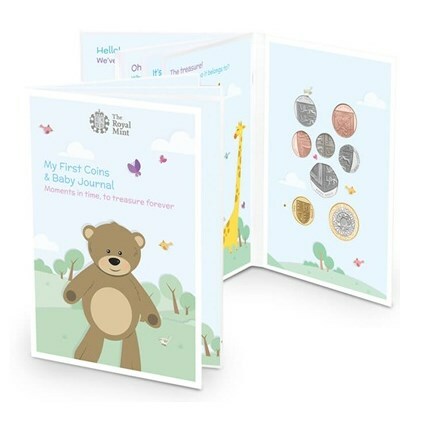 Other notable items in the Christening Collection include the 2013 My First Coins Baby Journal - a perfect christening gift for a newborn containing the eight definitive coins of the year, struck to brilliant uncirculated standard. The journal also includes 28 pages of delightful poems and illustrations where you can record your baby's milestones. The collection can be viewed in its entirety here. In other news, the Duke and Duchess of Cambridge have a new conjugal coat of arms which will represent them in heraldic terms as a couple. Designed by the College of Arms in London, Kate's personal emblem was joined for the first time with William's to create the new coat of arms. It was approved by the Queen and will represent the couple forever, however, as their circumstances and roles alter, elements of the accoutrements around the shields will change. Their Royal Highnesses will also retain their own coat of arms to represent them individually. Many of you will recall Kate was granted her own coat of arms by the Queen after the royal wedding in 2011. This was made by placing her father's arms beside those of her husband in what is known as an impaled coat of arms. 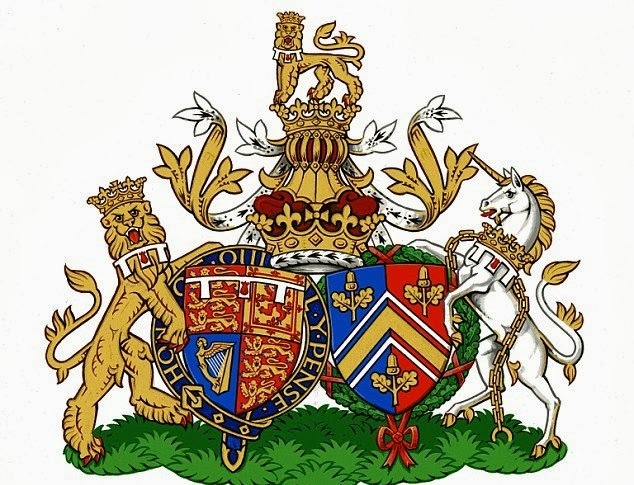 Another look at William and Kate's conjugal coat of arms. 'The shield on the left is taken from Coat of Arms granted to The Duke of Cambridge by The Queen on his 18th birthday. It shows the various Royal emblems of different parts of the United Kingdom: the three lions of England in the first and fourth quarters, the lion of Scotland in the second and the harp of Ireland in the third. It is surrounded by a blue garter bearing the motto Honi soit qui mal y pense (‘Shame to those who think evil of it'), which symbolises the Order of the Garter, of which The Duke is a Knight Companion. 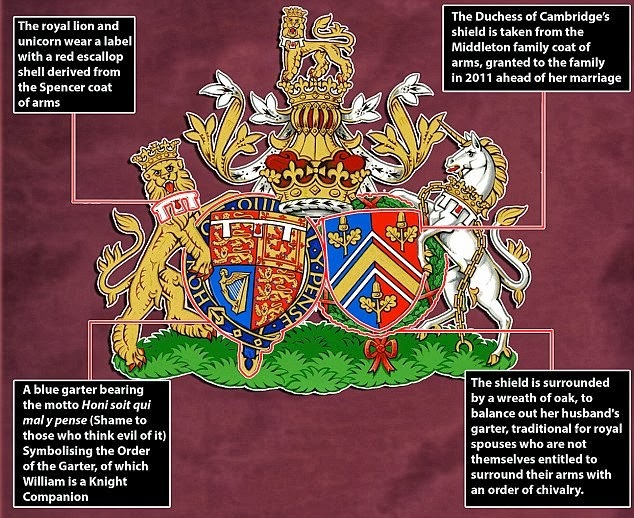 The Duchess of Cambridge’s shield on the right shows the Middleton family Arms, granted to her father Mr. Michael Middleton for the Middleton family in March 2011, prior to her marriage. The technical heraldic description of the Middleton Coat of Arms, known as a ‘blazon’ is Per pale Azure and Gules a Chevron Or cotised Argent between three Acorns slipped and leaved Or. Per Pale means that the Shield is divided vertically with one half blue (Azure) and the other half red (Gules). A Chevron Or means the gold chevron across the centre of the Shield. There are cotises either side of the chevron which are white (Argent). Slipped means ‘with a stalk,’ so the final part of the blazon – and distinguishing feature of the Shield – means three acorns with gold stalks and leaves. For its placement in the conjugal Arms, The Duchess of Cambridge’s shield is surrounded by a Wreath of Oak, to balance out the Duke’s garter. This is traditional for Royal Spouses who are not themselves entitled to surround their Arms with an order of chivalry. The coat of arms looks incredible and I had wondered for some time when we would see it. The College of Arms in London did a stellar job. What did you think of it? What a lovely post! I have been checking back all too often lately, out of lack of sighting, dates etc. This was a great part of my day! I love the information regarding the coat of arms. So excited for the Christening. A proud day for William and Kate indeed! Thank you again for this fabulous blog!!! Oh, I'm so excited about Prince George's christening! Can't wait to see the official pictures and his little baby face! I'm so curious about the color of his eyes and hair! It's a very intimate and cozy chapel they've chosen and I'm glad it will be a private celebration. George will be only 3 months old and a noisy crowd is the last thing he would need at the time. I really love their new coat of arms. That little lion above representing Prince George is very regal. Well, thank you, Charlotte for this great post. I'd like to wish all of you a lovely weekend! Lovely Chapel---so much better to have it in a Church rather than in Buckingham Palace. Prince George will be 3 months old by then and he was a big baby at birth---hope he will still fit in the Christening robe. God Parents are odd in the Royal Family--in the past some have been quite old---Prince Charles had Queen Mary amongst his. so it will be interesting to see who they choose. Great fast post! I can't wait to see all of the offical pics and videos of the baptzism. I do hope the new offical coin is better then the last one. Hopefully some new engagments are being announced soon! Oh Charlotte I was hoping you would give us a new post today reflecting the news of the christening. I love the idea of having it as SJP and in the same room where Williams beloved mother laid at the alter before her funeral. What a way to honor your mother. And that William & Kate are doing things their way. I hope once the christening is completed, that we will get to see the photos of the christenign plus the ones of the Queen, Charles, William & baby George. What a photo that will be. Have a great weekend Ms. Charlotte. I agree Pauline...I also believe there's an extra special significance to having the christening at SJP. William continues to honor Diana every step of the way. What a classy young man. She'd be so proud. And I can't wait for the photos. I concur, I think William and Harry are always thinking of their mother and there is a very special significance to having the christening at SJP. I actually don't think the couple chose the chapel because Diana's body lay there for a week. That really would be a quite morbid consideration in the context of a child's christening. I think the royal aide who commented is correct: they picked it because they liked its look, its intimate atmosphere. I don't blame them. It looks a lovely place for a christening. I hadn't realized the Jan Prevoost triptych "Virgin and Child with Saints and Donors" was so small. I'd seen it only in photographs that didn't offer a good sense of scale. I'm surprised. Make that "me three". It seems too morbid to think they would choose it because it reminded them of the most horrible time of their young lives. Many better ways to honor their mother that those young men live every day. Love that it is an intimate and ancient space. That speaks to the down to earth nature of the parents and the deep historical presence of four generations of a 1000 year-old monarchy. "Morbid" is relative. For example, I am fond of a particular church (farther than my own) because my grandmother's memorial service was held there and I feel a special connection to it. Perhaps it's a similar scenario for William. The Duchess of Cambridge was Confirmed in the Chapel Royal just before the wedding, so it will have those special memories too. Thanks for such a wonderful and informative post! I love the Chapel Royal at St. James Palace, it looks so intimate and such a wonderful spot for such an important occasion. Really looking forward to the pictures, especially of the Queen with her heirs. I wonder who the godparents will be? I personally don't think it will be either Harry or Pippa or James, since they are related it would be rather much to make them godparents as well. I think a mix of close friends and royal relations would be nice. I can't wait to see what Kate will wear! Their new coat of arms is spectacular! But, how is it different than their impaled coat of arms, I wonder? And why do they need another one? Thanks for the detailed description, I'm very interested in the symbolism and meanings behind the design and your description was great. Do you know when they would use their conjugal coat of arms as opposed the the Queen's standard, like they did on their tours? So many details involved in being a royal, but the British really do pomp and circumstance better than anyone. The impaled coat of arms is just Kate's. The new conjugal coat of arms represents the couple. Both photos in the post are of the conjugal coat of arms. very excited to hear this news!! Looking forward to the photos and video! God bless them all! I'm confused. I thought Harry was William's best man at the wedding? Hello! Both Harry and James Meade delivered the best man's speech at the wedding. Once again you are quick Charlotte. Wow. I am looking forward to the christening and the photo of the Queen with her three heirs. What a historic photo that will be. I am so thrilled to be living history. I am looking forward to seeing a good picture of Prince George. Thank goodness we have something tangible to look forward to. I know the Duchess and Prince William need time but I truly wish they would throw in one or two engagements to satisfy our thirst for them. Have a great weekend all. Thank you once more Charlotte. You are the best. I had to laugh at your comments (in a good way). I am having Duchess withdrawals and was wishing we would see more of Will & Kate. But then I had to remember that they are new parents and want to get to know their baby boy. If it was up to me Kate would be a full time mom and only do engagements with Will. But I know that will not happen. I truely hope that she can just handle the charities she already have and support William in his and just be a mom in the mean time. To me it is not the amount of charities you have it is what you can dowith the ones she already have. And so far she have done a great job. But she need's to focus on baby George & William. So now it seems we need to wait until Oct. 23 to see this beautiful couple & their beautiful bundle of joy. So excited about the Christening , looking forward to many lovely pictures! I didn't know that Diana lay in rest in the Chapel Royal before her funeral. Oh my gosh ,God rest her soul. What a sublime place for all things personal and intimate. As for God parents I'm sure they will chose well..
Love the info. on the coat of arms. Very interesting and informative. I'm really impressed with William and Kate's choice. The Chapel Royal is the perfect venue for the christening. That is a fantastic idea. I love the Repli-Kates and would definitely look forward to those posts. Another male reader dropping in to say hello and keep up the good work Charlotte. Hi lady Charlotte. Nice post . Im made up about the up coming christening of baby George at the historical st James' s palace chapel. Incidentally its the official court of the Head of state HM the Queen. It's where foriegn ambassadors are received. Buckingham palace is HM the Queen's official residence. It would be great if they could make the christening ceremony televised like they do on the continent for example as in Sweden and Norway with a choir etc. But I understand our tradditions so I respect protocol as it is. I don't like the idea of the Beckhams being godparents. Friend yes not godparents. This is not celebrity and should encouraged. Imo. If wills wants to be a little modern then somebody from the commenwealth countries maybe Canada, Australia or New Zealand A symbolic native royal cheiftan say. Britain has strong historic links with those countries. Very interesting information on the chapel. It's interesting to think in the earliest times, The Chapel Royal was not a building but an establishment. Of course since Whitehall Palace burned down in the 17th century the Chapel Royal has been based at St James's Palace. The chapel has an incredibly rich history yet it offers the intimacy required for a private family christening. I thought it an excellent choice for Prince George's christening. It will be a very special day for the family and chosen godparents. I'll be enormously surprised if we don't see at least one Van Cutsem, Van Straubenzee or Meade among the godparents. Think there will be a choir---even for previous Baptisms at BP the children of the Chapel Royal have sung. Ohhh I typed in you tube to try to see the inside of the chapel. Not much luck yet but , I did listen to the young boys and young men singing. Such beautiful voices! Well I'm not sure if there well be a choir but I'm sure many Angels will be singing. Charlotte, I think we'll see a Van Cutsem and definitely Thomas van Straubenzee. I hope the children of the Chapel Royal sing. The boys choir at Westminster is incredible and I always think it's a little taste of what heaven will be like. :) It will definitely be a beautiful and memorable day! Thank you for the photos of SJP, especially the altar area. Very touching that Will & Kate selected the Chapel Royal for George's christening. I really like their choice not only for the significant Diana connection but that it's a chapel vs. the BP Music Room. Great explanation re: the new conjugal coat of arms, too! It will be interesting to see how it changes in the years to come. Have a great weekend, and thanks again, Charlotte! The Coat of Arms looks magnificent and marries their individual ones beautifully. I'm sure most of you are regular visitors to William and Kate's official website where there is plenty of additional information and photos from engagements. Can you explain to me the reason William & Kate would want a conjugal coat of arms? I am trying to understand why. I don't believe that any of the other royal couples have one of these. At least I have not heard of them. I know it is for married couples but I was thinking it might be another way that they want to share thier love for one another. I am just a dumb person from the US who does not underatand the coat of arm thing.So I ma hoping you can shed some light on this for me. Thanks Charlotte. I will wait for your message tonight. Have a great weekend. Hope im not sounding presumptuous. Her Majesty is like a grandmother to me. I adore visiting this blog. It's my treat after a long day of wedding and event designing. Thank you so much. I only now have nerve to comment! Naomi, what a fun and I'm sure exhausting job you must have. Is that Lupo On the top of the coat of arms? I so enjoy your post. Like Pauline, I am from the US and are interested in learning more about the coat of arms and it's traditions. Keep up the good work. You are doing a great job. I adore the small chapel and it has such memories for William and Harry now the memories will include Prince George and Kate. Looking forward to the official pictures of George can't wait to see how he has changed in the last 3 months. My Mom always followed William and Kate with me and she is still here in spirit to enjoy all the fun. Thank you Charlotte for your support and all of the ladies on Duchess Kate Friends you are my rock and I love you all dearly!!! We love you too Robin! Sending love, peace and comfort to you with the lose of you mom. You have been a wonderful daughter. Robin, you are LOVED! You did a beautiful job with your mom's service. I hope you can hold on to all the happy memories. Lots of love and hugs! Robin we love you. You did a wonderful job on your moms funeral. I lovedthe CD you shared with us. The flowers were beautiful. hi, i wonder why past christening was done in music room, BP, any ideas? Prior to WW2 the majority of the Christenings (including the present Queen) were in the private Chapel at Buckingham Palace or Windsor. The BP Chapel was destroyed by bombing in the war. so I think they just transferred to another room there if a Christening was to be in London. Great photos of the inside of the chapel, what a great place! For those who might also be interested in the Queen, I just finished a fairly decent biography, although pretty gushy, about Queen Elizabeth II by Sally Bedell Smith. 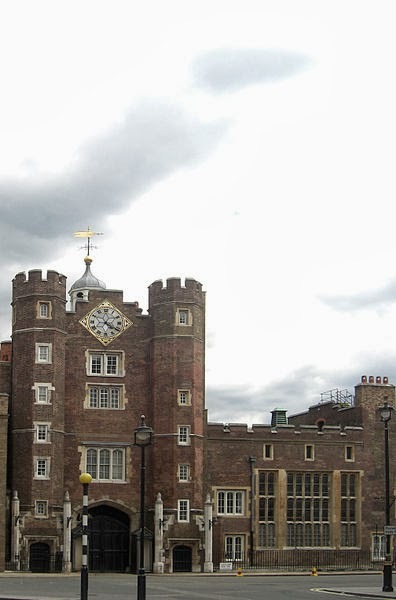 The biography was published a year after the royal wedding and suggests that William (and Kate) chose the Abbey for his wedding to banish the unpleasant memories he had of it, with him last being there for his mother's funeral. With similar associations for the chapel, it sounds like he's doing the same thing. Good for him. The biography doesn't go into much detail about Kate but it does provide a good glimpse into William's character and personality. Does anyone know of a good biography book about kate? It seems to me that we really don't know that much about her. Even though she's in the papers a lot. There is a new book just out called KATE... The Future Queen by Katie Nicholl. It has received good reviews on Amazon.com. I doubt that anyone who is not a fan of William and Kate would bother to read it, but I'm definitely looking forward to reading it. I just finished reading the book you are talking about. Yes there is some stuff written that we all know but there is other stuff that is new. I really enjoyed the book. You both will enjoy it I think. And I am a big fan of Will & Kate. What an interesting post! I'm very much looking forward to reading about and seeing pictures of Baby George's christening! I think the chapel looks very warm and nice. I think the conjugal coat of arms looks lovely. Thanks for the post Charlotte! Christening in the chapel were Diana laid is no morbid at all: instead, very sensible. Catherine is very able to speak with symbols: do you remember the trees in the church for their marriage? from death to new life, from pain to joy, the circle of life growing on itself, giving hope for something new which maintains memories of the past, but looks to the future. Great message, as usual. Nothing to do with morbidity, it's exactly the opposite. Hi Charlotte, thank you for your updates. It's always a pleasure to read you. You stated that beautifully, Paola. Paola , that is beautiful! Well, this "on the fence" person read the book. I thought it was a retread of information already out there, actually. There was some stuff that hasn't been in the public domain, but not much. Charlotte, that you for the lovely post and update. I am VERY excited about Prince George's christening! It will be a special and memorable time for each person there. There's a tiny part of me that is disappointed they chose The Chapel Royal as the Queen, Charles, and William were christened at Buckingham Palace. It would be nice to carry on that tradition, but that being said, The Chapel Royal is intimate and beautiful and I'm glad they chose to hold it in a church. I completely see why William and Kate chose it. It has such a rich history. It is a beautiful nod to Diana as it was her last resting place before going home to KP and then Westminster Abbey. William put to rest the sad memories of his mother's funeral when he married Kate in Westminster Abbey. Maybe he can do the same in The Chapel Royal with Prince George's christening. It most definitely will be a time that he wishes his mum could be there. 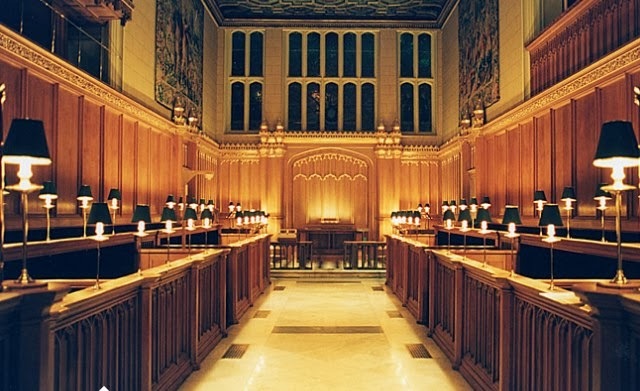 It also honors the Queen as her grandfather, George V, was married in The Chapel Royal. I am really looking forward to the photos that will be released, especially the 4 generation picture. It will be a beautiful day! Just 3 1/2 weeks and counting! The coat of arms is regal and majestic! They did a beautiful job bringing the two together! Thanks for sharing! Charlotte, I forgot to add that I read William and Kate will be moving into 1A this week. They have spent a fortnight at Balmoral and are headed back to London to move into and settle in their new home. Have you heard anything? This may sound silly, but I am sooo excited for them. I wish them many, many years of health and happiness. Finally what a relief this must be for them. They have been doing a lot of shuffling with a newborn. I am so happy for them to finally be able to settle in! Oh Charlotte, your reply made me happy. I am thrilled for them to be settled in their new home! Such a precious time as a family of 3 and the start of many great memories made. I know they must be relieved and looking forward to being all moved in. Will and Kate, congrats on the new home! I pray it will be a happy home and a peaceful sanctuary for you! Ok, now we finally have a specific date for the countdown! I'm glad they chose a small chapel in the Palace, it will certainly be an intimate and charming ceremony. I'm sure Pippa and Harry will figure as godparents, or even maybe James Middleton, and some of William's friends. Oh, I can't wait to see George again! I'm very anxious for the event! Thank you Charlotte, for this post. Have an excellent week. I'm very interested to see who the couple choose as godparents! This blog is one of my favorite pleasures...thank you Charlotte. Thoroughly enjoy reading your blog as I sit countless hours a day ( and night) nursing a newborn. Thank you for your tireless efforts Charlotte. Forgive me. Maybe I'm wrong, but I'm get exasperated that we are not seeing the Duchess more regal! Now we are hearing that her new "digs" at the palace are "boring" (my word) beige!! Where's the style? Where's the class? And when are we ever going to see her wearing a Tiara?!! Even The Countess of Wessex looks more regal and wears tiaras for heaven's sake! I'm sorry, but I'm disappointed. I am just glad we will have King Charles first!! Maybe it will give the Cambridges time to get it together and realize they ARE the future of the monarchy! Otherwise IMO it is the "dumbing down" of British Royalty. I don't want them to be like me. I want them to be ROYAL!!! !